You can't have a whole garden area named after you and stay hidden in the background of all the photographs. Here is the famous Moosey Hen House. But a word of warning - the photographs on this page are all from the archives. This well built, dry, and totally comfortable structure still survives in the garden, but is now totally hidden by the garden growth. Silly me. 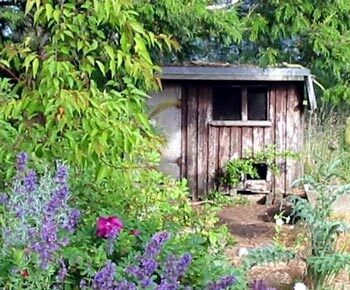 I used to keep a couple of garden chairs in here, for late afternoon sitting and dreaming sessions. I'd sometimes wich that I could sleep over in it! The dry gardens to the right were planted with Pittosporums and Hebes and these shrubs are now well grown. 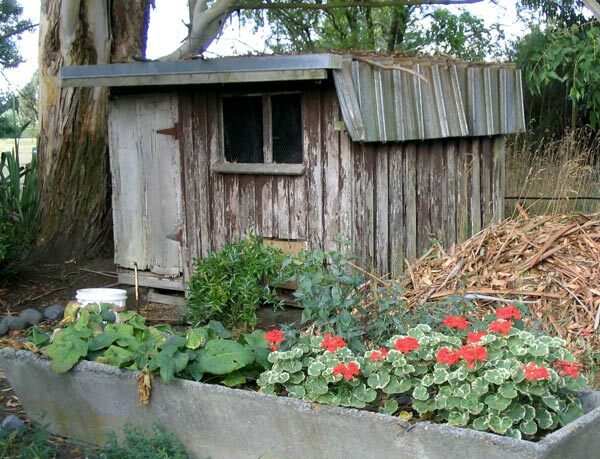 The hen house deserves some new landscaping, to rekindle its ambience as a quaint rustic retreat. 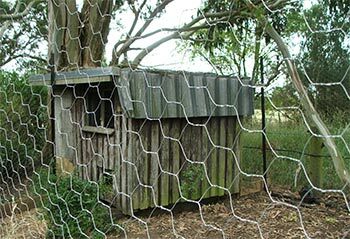 In 2001 I was looking after a visiting rooster and two hens, and thought seriously about returning the Hen House to its original purpose. Except the hens refuse to be encouraged across nearby Rooster Bridge, and were too difficult to catch. The rooster had no problem - he must have sensed that the bridge was appropriately named, even after his good feathered self. But visiting rooster was extremely street-wise, as roosters go, and I couldn't catch him, either. In 2007 I got some proper hens in residence. And a rooster, who seemed quite superfluous, but never mind. And I loved the eggs they lay. So there was no more hiding in the hen house for me, trying to get away from the telephone! A chicken run was built, added on to the hen house. It was quite large, and gave the chooks a great place to scratch, have dust baths, and socialise. The concrete trough was originally placed here for stock water. Each year I'd fill it with variegated cherry red flowering pelargoniums, which I'd promptly forget to look after. Alas, the Hen House Gardens are now chookless - though I do have a wee collection of hen sculptures to take the place of the real thing.